See how much you can save with fewer applications of fertilizers Driven by Duration. Calculate your fertilizer cost-savings with the Square Foot Advantage Calculator. 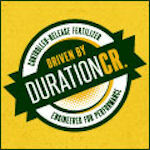 Begin by visiting DrivenByDuration.com: An easy-to-use calculator will take you through the steps to compare the total cost-in-use of what you’re currently using to fertilizers Driven by Duration. For a more in-depth comparison, contact your distributor and proceed through the calculations together. In the face of rising operating costs and environmental concerns, take the time to go online and find out how fewer applications can save you time, labor and improve your bottom line.